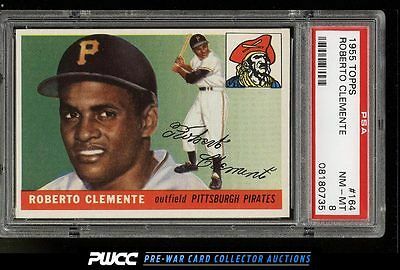 *Auction 7, Vintage Round 2* A world class Clemente RC on the auction block. Simple as that. Virtually NM-MT+ or better card stock throughout with four exceptional corners, flawless edges, and surfaces which appear worthy of a PSA 9. All told this is an exceedingly bright and fresh example which easily ranks among the hobby's finer PSA 8s. Rarely do copies of this quality, which hold this level of eye appeal, surface on the open market. We are proud to present this blue-chip investment piece to the eBay community, free of reserve or any other restriction. Enjoy! One of nearly 20,000 cards, lots, and sets up for bid in our 7th Auction of 2016. Click on the link above to view the other PWCC auction lots.